Vanessa Wolf is a former head chef. 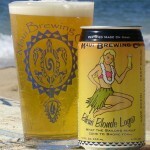 She offers her frank assessments in the interests of honesty and improving Maui’s culinary scene. In little more than an hour (correction: day. 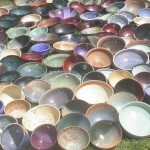 Thanks for the catch, Laura G. ~VW), Star Noodle’s annual Empty Bowl Project benefit kicks off. Whether due to claustrophobia, empty bowlophobia, conflicting plans or something else entirely, those who miss the event can still take in a little Star flavor without battling the constant, daily crowds the restaurant is (in)famous for. 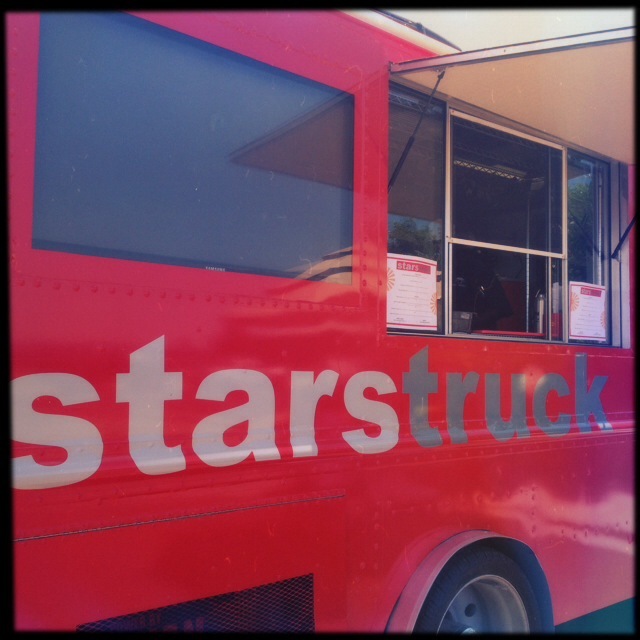 Well, in the last month, the beloved Lahaina institution has ventured full-time into the food truck game with StarsTruck. Kudos to the person or team responsible for the undeniably perfect name: clever, memorable and just enough braggadocio to get one’s hopes up. We started with the Fried Saimin ($8). 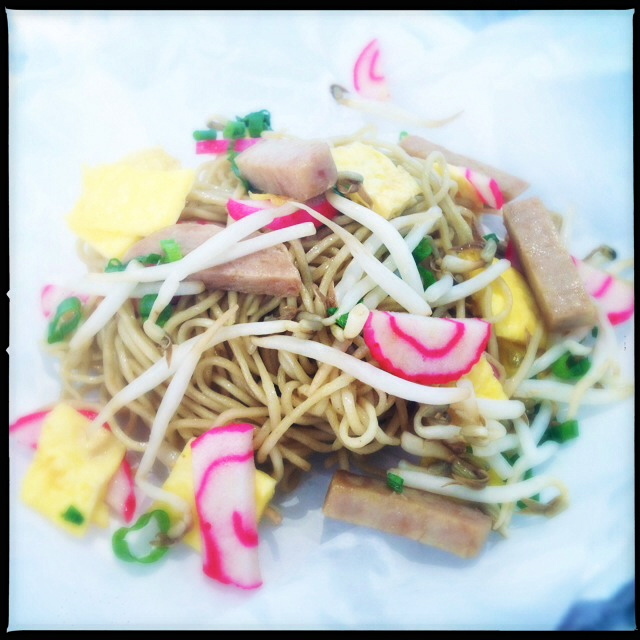 The traditional take on the popular local dish features noodles topped with kamaboko, Spam, scrambled eggs, bean sprouts, and scallions. It’s very by-the-book in presentation and taste. On the whole, we tend to shy away from day-glo pink fishmeal products (not to mention Spam), but the festive, candy cane-esque kamaboko makes any dish look like Christmas morning. The portion could best described as “reasonable” more than the monstrous King Kong serving often doled out on the islands, but if you’re craving a simple Hawaiian classic and aren’t worried about your cholesterol level, you can’t go too wrong here. For the moment, the truck isn’t really ‘on the road’ so much as ‘parked on a single road.’ It sits daily in the concrete dead-end area adjacent to the restaurant. On both visits, there were two affable men running the show. Despite being the only customers not already eating, food prep was sloooooow going: i.e. half an hour from order to delivery. There’s a single covered picnic table nearby, which gets cramped fast. Granted, the truck and its chefs are likely still finding their footing. On one visit, the customers before us received undercooked chicken on their garlic noodles. That stated, they were promptly given an apology and refunded their cash. Things happen, and – in our opinion anyway – the only real mistake is not learning from a mistake. 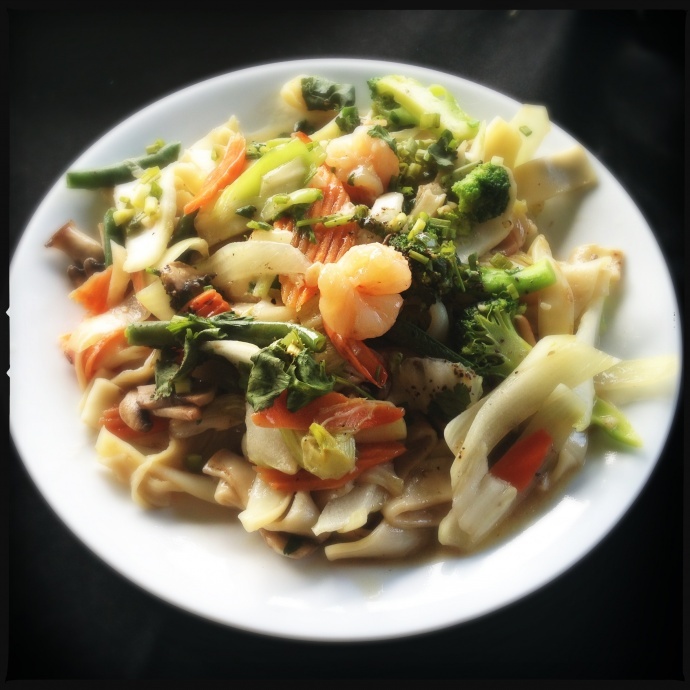 A little spooked out nonetheless, we decided to try the Loaded Garlic Noodle with Shrimp ($10) instead. 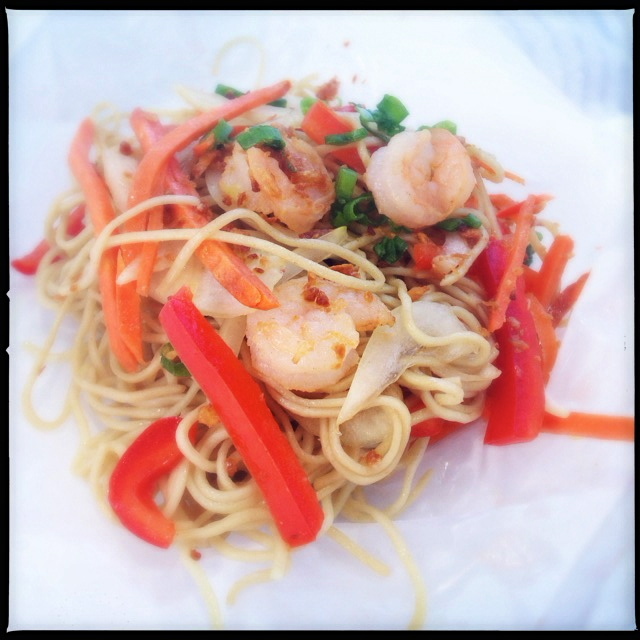 The same saimin noodles reappear and are covered with fried garlic, dashi, green onions, red bell peppers, Maui sweet onions, carrots and six shrimp. To be frank, it’s hella bland and fairly oily. The only real flavor of note being that of the garlic, the dashi (a simple Japanese broth made from kombu [kelp] and bonito [fermented fish flakes]) is too subtle in comparison. We love the concept of using dashi though: maybe mix it with some mirin and soy and serve it on the side, a la tempura? The StarsTruck menu offers just one drink: the 22 oz. “Daily Aide” ($3). On both occasions they were serving a cucumber version. Although trepiditious at the concept, the drink more than proved us wrong. 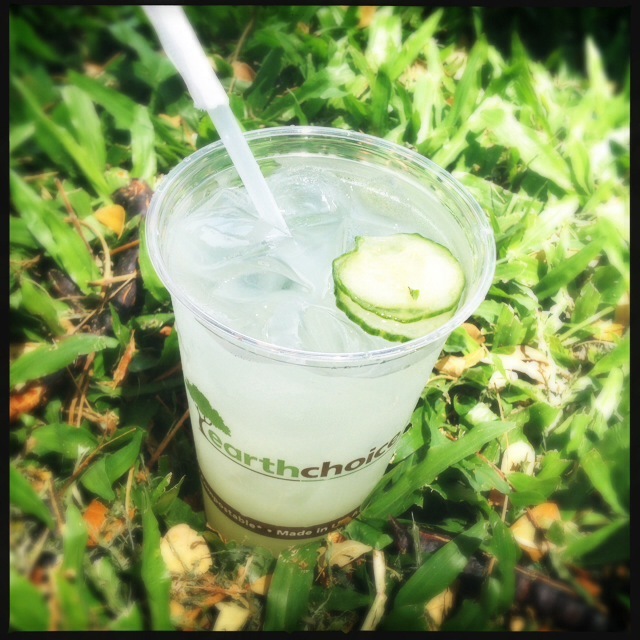 It’s surprisingly cucumber-y, thirst-quenching and only mildly sweet. Definitely give it a whirl. 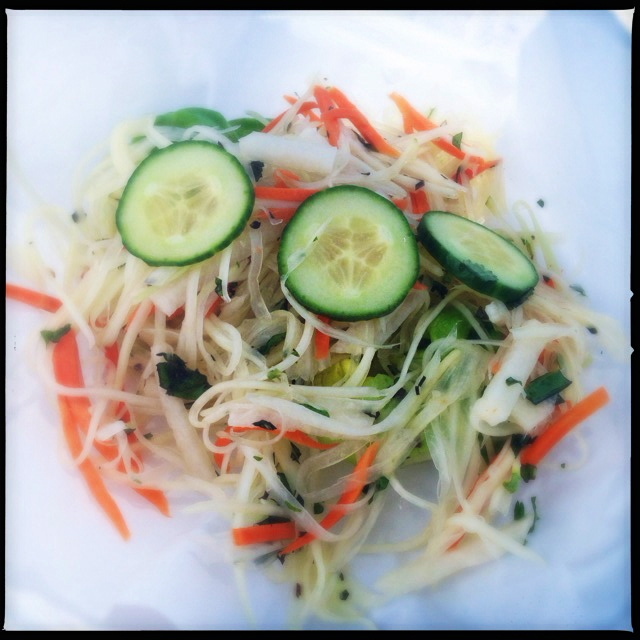 The Green Papaya y Jicama Salad ($4) is good stuff. 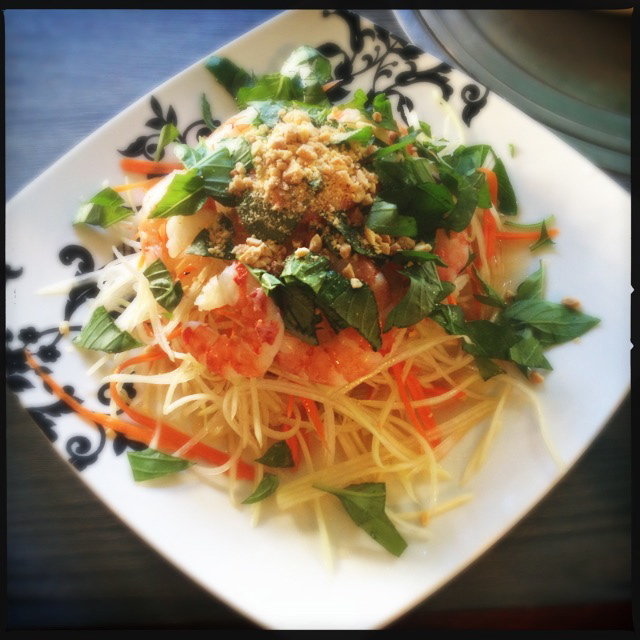 A true blue interpretation of the Vietnamese version of the dish, the fusion twist of crunchy jicama slices add a nice crunch. The mint takes a back seat to the Thai basil and fish sauce, but the flavors mingle beautifully nonetheless. All told: light, refreshing, and a generous portion for the modest price. 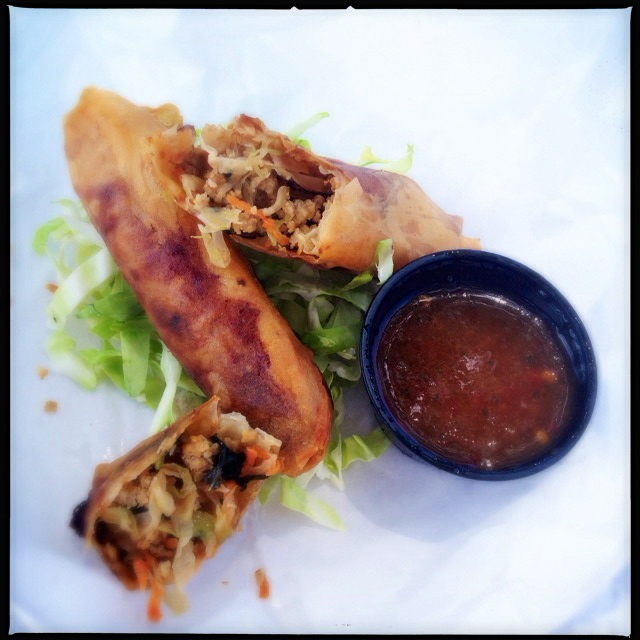 The Thai Spring Rolls ($5) were less to our liking. Oh, Mylanta! these babies are greasy. One Abe Lincoln nets you two deep-fried bundles where inside you’ll find cabbage, carrots, onion, Thai basil and ground pork. Truth be told, the only real flavor we could discern was that of the Other White Meat. Happily, the accompanying sweet chili dipping sauce helps to uplift the heavy morsel. 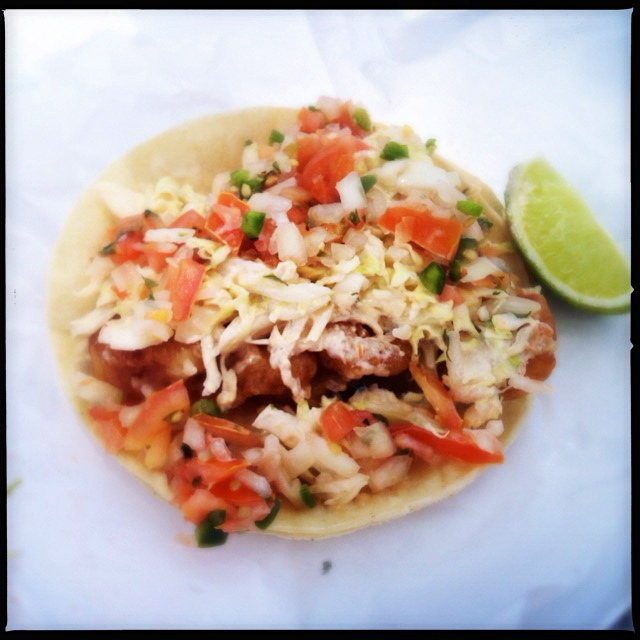 Last up was the Tempura Shrimp Taco ($5). We like it all: the price, the portion, the presentation and the taste. Seven freshly-fried tempura shrimp overflow from the double corn tortilla shell and are accompanied by cabbage, pico de gallo and a creamy sauce. Yes, we’ve been hard on many a seafood taco predecessor, but take that for what it’s worth: we are no pushovers in this regard. Moreover – believe it or not – this one lives up to our high standards with its embellished (nay, improved) take on the traditional Baja preparation. Bravo: star struck indeed. 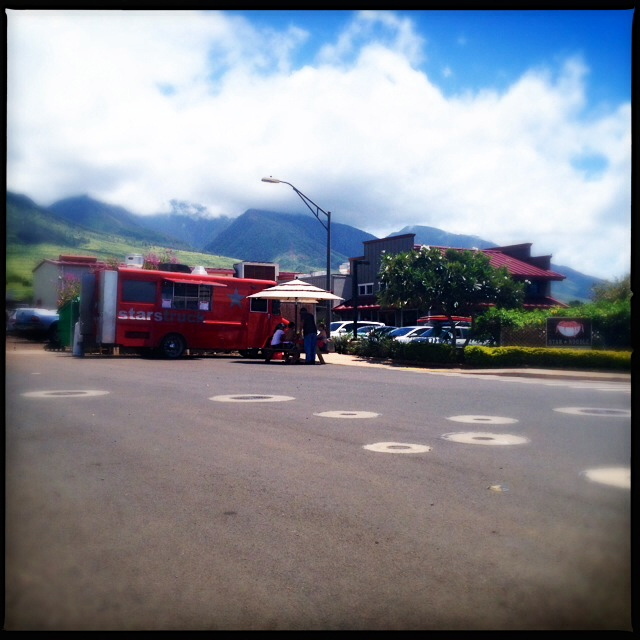 StarStruck is located at 286 Kupuohi Street in Lahaina, and if you’ve never been there, plan to break out the GPS. Find it and the shrimp tacos daily from 11 a.m. to 4 p.m.